Abstract. In egg laying species, breeding females may adjust the allocation of nutrients or other substances into eggs in order to maximise offspring or maternal fitness. Cooperatively breeding species offer a particularly interesting context in which to study maternal allocation because helpers create predictably improved conditions during offspring development. Some recent studies on cooperative species showed that females assisted by helpers produced smaller eggs, as the additional food brought by the helpers appeared to compensate for this reduction in egg size. However, it remains unclear how common this effect might be. Also currently unknown is whether females change egg composition when assisted by helpers. This effect is predicted by current maternal allocation theory, but has not been previously investigated. We studied egg mass and contents in sociable weavers (Philetairus socius). 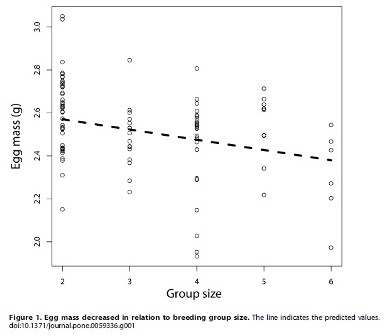 We found that egg mass decreased with group size, while fledgling mass did not vary, suggesting that helpers may compensate for the reduced investment in eggs. We found no differences in eggsâ€™ carotenoid contents, but females assisted by helpers produced eggs with lower hormonal content, specifically testosterone, androstenedione (A4) and corticosterone levels. Taken together, these results suggest that the environment created by helpers can influence maternal allocation and potentially offspring phenotypes. Maternal effects in Sociable Weavers. 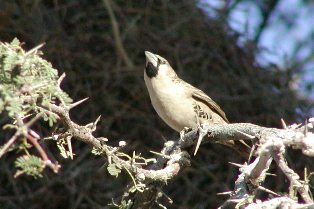 Thermoregulation in Sociable Weaver nests. See PHOWN records from Benfontein here.